The state and the voters that doomed her 2008 candidacy may have just done the same to Bernie Sanders. Clinton won because she treated the state as a proxy for the African-American vote nationwide, which she will need desperately in this primary, and even more in November. South Carolina turned out to be a proxy for the black Democratic primary vote in 2008—and she lost it badly to Barack Obama in a bitterly fought contest. Her husband insulted the winner by comparing his victory to the Rev. Jesse Jackson’s powerful but unsuccessful symbolic candidacy. Her campaign hemorrhaged African-American support after that, and Clinton never recovered. What a difference eight years make. Black voters made up a higher percentage of South Carolina voters than they did in 2008 (61 percent to 55), and they gave Clinton a higher percentage of their votes than they did to Obama. She was introduced Saturday night by Congressman James Clyburn, who fell out with the Clintons over their perception that he favored Obama in ’08 (though he had stayed neutral in the race). This year Clyburn endorsed Clinton, just a week before the primary, and he wasn’t exaggerating as he declared, “We, tonight, have started Hillary Clinton on her way to the White House.” She hugged Clyburn for an extra few seconds when she joined him on stage Saturday night, as if to hold on to the moment after the stinging rebuke of 2008. If she wins, it began for real right here. Clinton can only hope the rest of the race looks like South Carolina. (Of course, it doesn’t.) She won women 74–26. She even won white voters here, although the white vote was down from 2008. 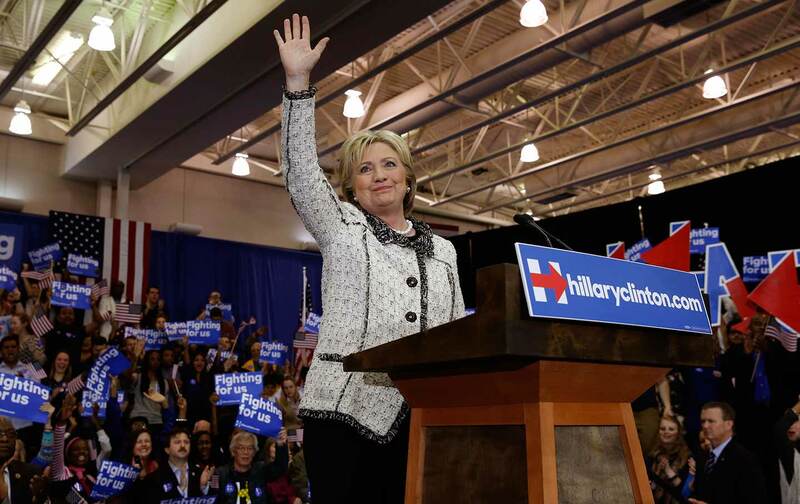 The rout bodes well for her performance in the more diverse Super Tuesday states, and, indeed, polls released Sunday showed her with at least 20-point leads in those states. But Clinton didn’t just win South Carolina; Sanders lost it. He lost it when he interrupted Brookland Baptist churchgoers on February 21 during their after-service meal, looking like an awkward guest. (It would have been smarter to choose a different day; people here are serious about church, and their after-church eating and socializing.) And he lost it again when he chose not to really contest the state—even though, let’s be fair, he was already pretty likely to lose—and traveled mainly to majority-white Super Tuesday states this past week instead. Going forward, the Sanders team has drawn the map with an eye on Massachusetts, Vermont, Oklahoma, Colorado, and Minnesota on Tuesday, and little attention to the heavily black states of Alabama, Arkansas, Georgia, Tennessee, and Virginia. He didn’t stay to deliver a concession speech, as Clinton did when she lost New Hampshire badly. Those decisions were felt keenly at the Liberty Tap Room in Columbia Saturday night, where African-American surrogates for both candidates made the rounds to congratulate and console one another. State Representative Justin Bamberg, who switched from Clinton to Sanders, congratulated Clinton-supporting colleagues like his party’s Democratic leader, Representative Todd Rutherford. A gracious Symone Sanders, the Vermont senator’s talented communications director, came through as well, accepting condolences from friends on the other team in a state she cared about deeply. Several people from both sides told me that it would have served the candidate himself to treat South Carolina with the same care. Sanders was in the air to Minnesota when the results came in. He congratulated Clinton to reporters on the plane with him, but didn’t mention her win in his speech when he landed. When the crowd, as every Sanders crowd does, “guessed” the amount of his average donation—$27—he replied: “There’s no way we’re going to lose Minnesota. I can see that. You’re just too smart.” In the context of the speech, it was playful. In the context of the night, not as much. I don’t think he meant it the way it sounded, but that might be the story of his campaign for black votes. At a table across the room, State Representative Gilda Cobb-Hunter, who remained neutral in the race and said she intends to stay that way, tried to make sure both sides kissed and made up. “We’ve got to worry about November,” she told me, when the nominee will need a massive voter turnout, especially among African Americans, to beat the Republican. She was worried by the 11 percent turnout rate on Saturday, when about 370,000 South Carolinians voted, compared with 532,000 in 2008. Although Clinton congratulated Sanders on his campaign, she seemed to look ahead a bit in her speech Saturday night, toward a campaign where she is increasingly likely to face the menace of Donald Trump. “Despite what you hear, we don’t need to make America great again,” she tweaked the GOP front-runner. “America never stopped being great. But we do need to make America whole again.” She quoted First Corinthians—you’ll recall that Trump mangled “Two Corinthians”—and reminded the crowd “Love is kind.” She spoke repeatedly of bringing “love and kindness” to politics. She and her supporters will need that to win over Sanders’s backers, if and when the time comes. It may even be a message that counters the Trump bile, but we’re less sure of that. The crowd in the University of South Carolina volleyball gym grew silent, and solemn, when Clinton recited the names of five crucial supporters, the women who have come to be called “the mothers of the movement”: five African-American mothers who have lost sons to violence, mainly at the hands of the police, who traveled this state for her. Her embrace of those mothers, and their embrace of her, marked a political and stylistic contrast with 2008. An African-American food-service worker at the gym, in a rumpled black-and-white uniform, had left her shift to watch Clinton thank the crowd. Her eyes welling with tears, the woman could finish the lines in Clinton’s speech, the way supporters in 2008 did with Obama. “I just love her,” she told me, as she dove forward upon seeing Clinton had left the stage to shake hands. Just like her husband used to do, Clinton waded into the adoring crowd and made her way in a circle around the stage, shaking every hand she could reach. Then she made her way back again, as though she wasn’t ready to leave.